Painter Asya Geisberg has opened a new gallery at the old Goff + Rosenthal space on 23rd Street in Chelsea. 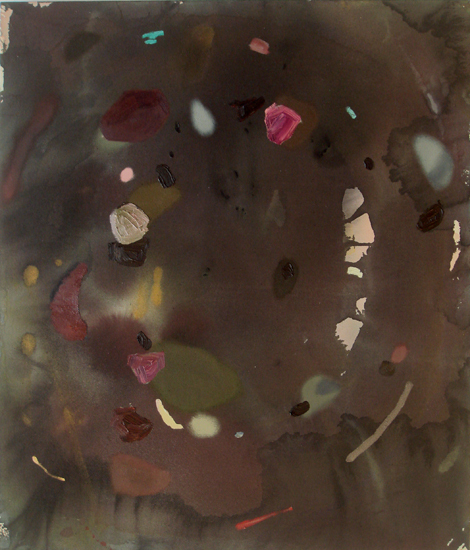 Born in St. Petersburg, Russia, Geisberg has lived in the US since 1977. She studied literature and history at Wesleyan and received an MFA from the School of Visual Arts. “Shadows Slipping,” an exhibition of new paintings by Angelina Gualdoni, is her inaugural exhibition. 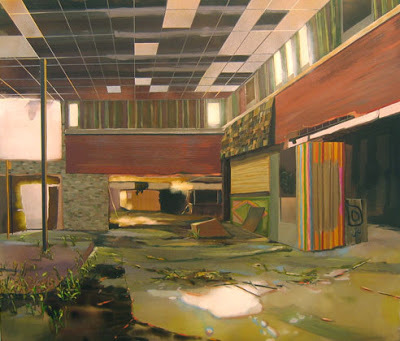 In earlier work, Gualdoni investigated failed utopias of Modern architecture, portraying decayed, imploded buildings crumbling into pools of paint. 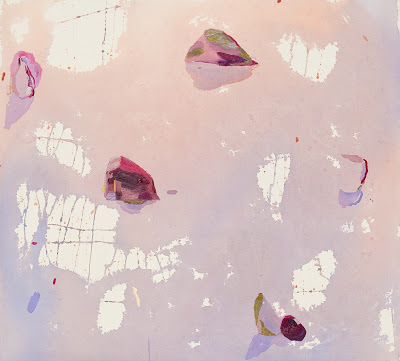 In “Shadows Slipping,” she loosens control, and, like color field painters before her, begins each painting with a thin veil of poured paint that determines the direction the canvas will take. “The shift in the work,” Gualdoni writes, “compared to previous bodies, is in favor of improvisation, and against a photographic basis, in favor of degrees of presence.” There’s a poignant sense of unknowing in Gualdoni’s impressive new work. 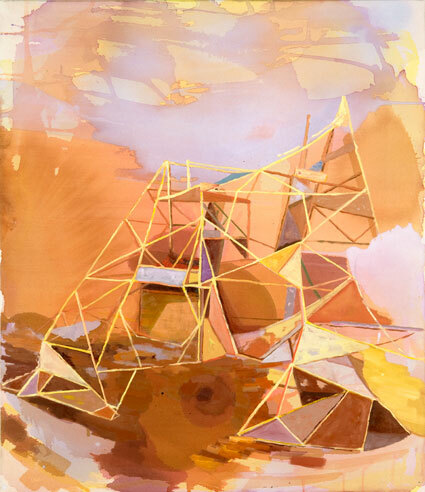 Whereas in previous paintings she featured lavishly-painted structural elements of defunct worlds, in her new work Gualdoni sheds the nostalgic architectural references and authoritative facture to find meaning in the process itself. Gualdoni is decisively moving forward by imagining how we might build something unfamiliar from our inherited wreckage. 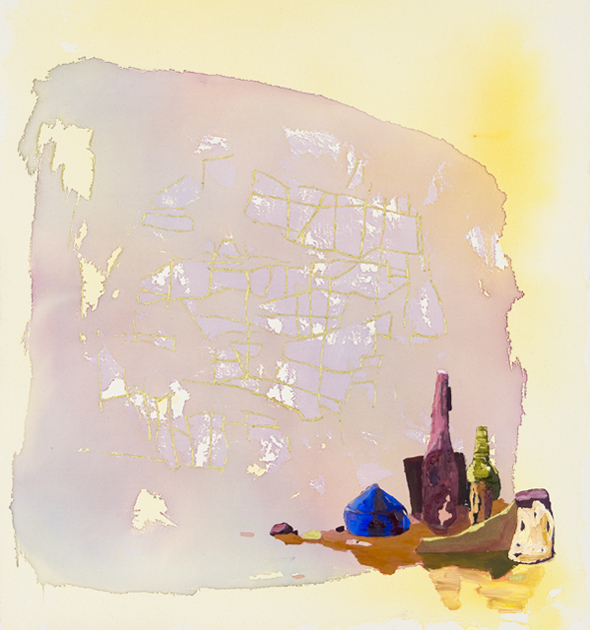 “Angelina Gualdoni: Shadows Slipping,” Asya Geisberg Gallery, New York, NY. Through Nov. 6, 2010. They are incredible! I am a new fan! Interesting connection between your painting in gallery195 and Gualdoni's "Given Ground". Your lines are attached as separate part of the same body creating tension. Gualdoni's lines sit on top of the painting as if an afterthought but they work harmoniously (and beautifully) with the painting. As a new subscriber I thank you for your blog which is really great for painters.